The room grew silent as Harran grinned. He was pleased with himself, and at the wit that had flown from his lips unbidden. Dorovich slowly turned, and looked at him. The old man's expression hadn't changed, and he wiped one, arthritis-swollen knuckle along the side of his nose. "What did you say?" Dorovich asked in that slightly wheezy way he had of speaking. "Are you going deaf, too?" Harran sneered, stepping closer. "I said-"
Harran had drawn in breath to repeat his earlier verbal barb, but before he could Dorovich slammed a fist into his stomach. Harran doubled over, one hand protecting his gut, the other scrabbling for his dagger. A cloudy glass, still half-full of beer, slammed into Harran's face. His nose broke with the sound of a pine knot on the fire, and blood jetted down his front. His knees folded, and he fell bonelessly onto the taproom floor. Dorovich tossed the remains of his glass on top of Harran, and turned back to the bar. "Another," the man once called the Hammer of Dry Lake said. "He's paying for it." 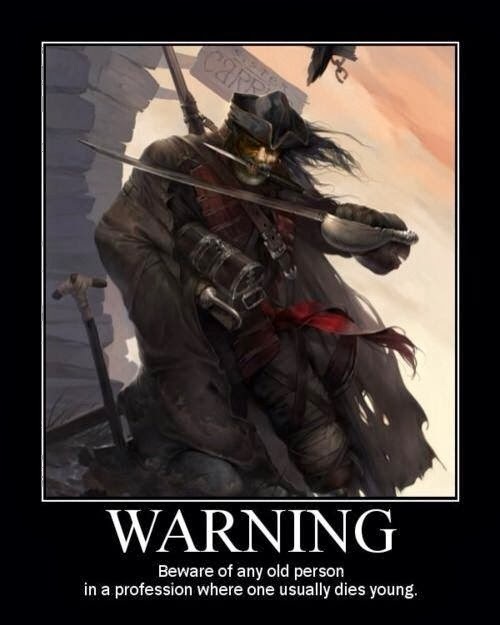 Seriously, adventurers only get more dangerous with age. We're all familiar with this kind of character. He's Logen Ninefingers in Red Country, both Riggs and Murtaugh in the later Lethal Weapon movies, and pretty much every member of the first generation Expendables team, and every protagonist in RED. These characters may be old enough to have grandchildren, but they are still canny, capable, and dangerous. Even if it takes them a little longer to bounce back from a brawl than it used to. There are some characters you'll note who are absent from the list of examples; wizards and witches. Because while nothing says those characters have to be old and gray, it isn't unusual to find a Gandalf or McGonagall look-alike wielding great power, and then using their relic staff as a walking stick. What is unusual, though, is finding a character with a more martial skill set who is still breaking teeth and wrecking house long after most folks figured they would have hung up their baldrics. If you're playing a system like 5th Edition DND, this is purely a flavor thing. To the best of my knowledge, age penalties are something Wizards chucked in the bin when they stepped away from 3.5. However, if you're playing a Pathfinder game then you take penalties for middle age, old age, and surviving long enough to become venerable. Make that work for you. For example, an aging swashbuckler may not have the raw Dexterity they once did, but their enhanced Charisma means they can make better use of their deeds now. A venerable paladin may seem to be just an old man past his prime, but when it comes time to smite an evil creature he suddenly becomes a titan both in his damage output, as well as in his attack and defense. An aging bloodrager may not be able to crush a man's skull in one hand like she used to, but the raw, potent force of her bloodline's magic is more than enough to make up that difference. Even an aging assassin may not have the grace they once did, or the ability to blend quite so seamlessly into alternative personas, but they know more than a dozen of their younger protoges combined, and surviving their death stroke is nearly impossible once it's been delivered. One of my favorite combinations for this is an aging barbarian with the Spring Rage power. A titan in their youth, when the fresh wind blows again all their raw, physical power comes flooding back into them... for a little while, at least. If you combine this with an Intimidate-based build to make use of your heightened Charisma due to age boosts, you can have a potent mixture on your hands. If you enjoy this concept, then you may also want to check out my post Adventuring Isn't Just A Young Man's Game (5 Questions You Should Ask For Older PCs). But Why Wait So Long? There's a common misconception that all levels gained are done so in a linear fashion. It's why so many PCs are young and fresh; they're first level, and they have no experience. Toss that idea right out of your head for this concept! If you're an older character, and especially one who's been around and done their share of stuff, feel free to embellish their history and talk about how badass they used to be. Just keep in mind what I said in The 1st Level Badass (Freeing Your Backstory From Level Restraints). Just because you were amazing then doesn't mean you kept all of that prowess and skill. You might need a refresher, and a little time to work the kinks out before you get back to your former glory. That's all for this installment of my Unusual Character Concepts! If you've had an older character of your own (whether they started that way, or just ended the campaign at a venerable age), leave it in the comments below! For more of my work, check out my Vocal archive, or just click my Gamers profile to see only my tabletop stuff. You should also drop by the YouTube channel Dungeon Keeper Radio, where I make videos with other gamers that are meant for players and dungeon masters alike! To stay on top of all my latest releases, be sure to follow me on Facebook, Tumblr, and Twitter. If you'd like to support me, then you can leave me a one-time tip by Buying Me A Ko-Fi, or you can leave me a regular, monthly tip by going to The Literary Mercenary's Patreon page to become a patron. Lastly, consider heading over to my Amazon author page to Buy My Books, if you're in need of a good read! What Holidays Are Celebrated in Your Game?